Acreage reported 2018 Q4 results and revenue soared 91% to $10.5 million aided by new store openings and acquisitions. Despite the growth, Acreage's revenues remain one of the smallest among multi-state operators due to a footprint that is spread too thin. We prefer other MSOs due to cheaper valuation and similar, if not better, growth prospects due to their dominance in certain key markets. Welcome to our Cannabis Earnings series where we break down the latest earnings to help you focus on the most important topics. Acreage Holdings (OTCQX:ACRGF) reported 2018 Q4 results recently and it posted impressive top-line growth supported by recent store openings and continued consolidation of key assets. However, despite its premium valuation, we think Acreage will likely lag behind its peers in the near-term due to its footprint that lacks focus and core competency. We continue to rate Acreage neutral and favor other multi-state operators, or MSOs, due to better growth prospects. On March 12, Acreage reported its 2018 Q4 results which showcased strong revenue growth at the multi-state operator. Fourth-quarter revenue increased 91% from last quarter as Acreage aggressively pursued new store openings and consolidation of non-controlling interests. The company opened 2 new locations in New York and Massachusetts and acquired one additional location during Q4. The biggest revenue contributors were Oregon, Connecticut, and Maine where Acreage had multiple stores. Acreage had only one open store in each of the rest of the states. Gross margin rebounded to 42% which is still at the mid to low-end of the range reported by its peers. Post-Q4, the company closed additional acquisitions in Florida, Illinois, and Connecticut. As of March 12, Acreage operated 24 retail stores and that number is expected to increase substantially as it expands in a number of states. We think Florida is a key market due to its supportive demographics and the ability to open up to 35 stores. Acreage expects pro forma Q4 revenue to be $16 million after accounting for new stores and acquisitions that closed during the quarter but excluding managed revenue which it doesn't consolidate in the reported numbers due to lack of controls for these ownerships. It is pretty common to see pro forma revenue much higher among cannabis companies due to the nascent nature of this industry. However, it is also important to realize that most of the states that Acreage operates in are small where it has only a single location that is unlikely to generate much growth going forward. Acreage's footprint is heavily skewed towards the East Coast which comprised of many smaller states. It is also notable that Acreage does not have any presence in Nevada and Arizona where most other MSOs have invested heavily recently. From this perspective, we think it is important to analyze each MSO's footprint before using the total number of states as a proxy for market potential and growth profile. Acreage also has one of the smallest revenue at this point which we think is due to a lack of core markets (Harvest Health and Cresco Labs have not reported Q4 so numbers are understated in the table below). 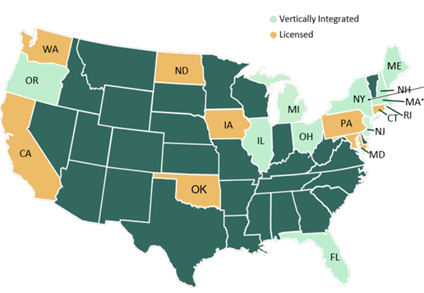 We have seen that many companies grew from a single state where they have a dominant market share including Cresco Labs (otcpk:CURLF) in Illinois and Harvest Health (otcqx:HRVSF) in Arizona. The fact that Acreage only had a single store in most of the key markets limited its ability to scale up and drive efficiency which would negatively affect revenue and profit margins. Acreage is currently trading at 44x EV / annualized revenue which is at the high end of its peers. While Acreage reported impressive revenue growth last quarter, the company remains relatively expensive due to the large market value and small revenue base. Acreage's premium valuation is likely a result of its impressive Board consisting of famous politicians and senior corporate executives. However, we think Acreage's growth prospect is potentially inferior compared to other MSOs due to its reliance on smaller states on the East Coast and its absence in two key markets, namely Nevada and Arizona. At the end of 2018, Acreage had $250 million in cash and short-term investments which provide ample capital for continued growth and investments. The company has a pretty tight capital structure with 106 million shares outstanding and very little debt. We don't foresee any need for near-term financing absent any major acquisitions funded with cash. Acreage raised $314 million at $25 per share during the RTO and the stock has been unable to break that mark since it went public in late 2018. We think Acreage is one of the key consolidators in the U.S. cannabis market due to its impressive management and board compositions which resulted in its unparalleled access to capital. Furthermore, the company has acquired assets in most of the key markets and is in the process of rolling out its Botanist brand nationally. We think revenue will continue to grow substantially but valuation leaves us on the sidelines due to its relative expensiveness. In today's market, there are several options for investors looking for exposures in MSOs. Acreage is substantially more expensive than Green Thumb (otcqx:GTBIF), MedMen (otcqb:MMNFF), and iAnthus (otcqx:ITHUF). Due to the above, we would recommend investors to consider other MSO names that offer similar or better growth at lower prices. We have argued that the best way to invest in the U.S. cannabis market is through a portfolio approach and Acreage could certainly be considered a core holding within a diversified portfolio. However, we would underweight Acreage at this point due to the reasons described in this article.